In this episode of Glance at the Past, Grab Corners, now known as Campau Square, was the first S-Curve of Grand Rapids. A steep grade difference forced the Common Council to raise Canal Street four feet. A hotel downtown remained open while being raised to be level with the new street. The first “S” curve in Grand Rapids was not on US131, but was located at Grab Corners, now Campau Square. Horse-drawn wagons found it difficult to navigate the curve, not only for the sharp turns, but also due to a steep, four-foot grade difference between Canal Street and Monroe Avenue. In 1870 the Common Council voted to literally raise Canal Street four feet, and this enormous task began in 1873. Wagons carried earth from Prospect Hill and began filling and raising the street. Of course this created a problem, for now the main floors of the buildings sat four feet below Canal Street. The city hired Hollingsworth & Coughlan of Chicago to complete the project. 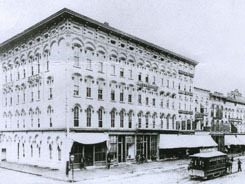 Sweet’s Hotel at the corner of Canal and Pearl streets was the largest structure to be raised. Truman Lyon, operator of the hotel, insisted that it remain open while the building levitated to street level. The project took 1800 screw jacks, 300,000 feet of timber, 217 workers, and cost the city $5000. Each man was responsible for operating three to ten jacks. When a whistle sounded each man turned the jacks under his care. All day long, every time the whistle blew the jacks were turned and each revolution raised the building ¼ of an inch. After four days of work Sweet’s Hotel stood 4 feet 1 inch higher. A new foundation was laid, and six weeks later the hotel was lowered 1 inch onto its new base.